Friendship Bracelet Swap 2.0 | Oh Sarah O ! Hey everyone! Last month I decided to participate in the Friendship Bracelet Swap 2.0 hosted by Chasing Davies to give myself an excuse to try my hand at creating some of the fabulous friendship bracelet's that I had been seeing on the blog-o-sphere. Soon after signing up, I was assigned to my friendship bracelet swap partner, Miss Sassypants, and I got to work. After exploring Miss Sassypants' blog and conversing with Miss Sassypants herself in a few short e-mails, I learned that she is one hip, fashionable, and hilarious lady who happens to like the color purple and have an affinity for all things polka dot and stripes. So, for the friendship swap I decided to create 3 hip, fashionable and cool purple bracelets. 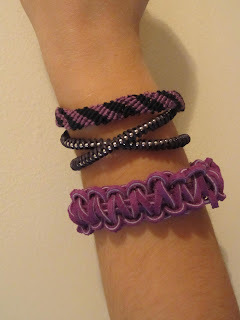 For the top bracelet, I decided to create a traditional, woven, candy stripe bracelet using purple and black DMC floss (this tutorial and this tutorial were very helpful in creating this bracelet). For the middle bracelet, I used a tutorial from Honestly WTF except I omitted the DIY hex nut clasp and used a regular jewelry bracelet clasp instead. For my third (bottom) bracelet, I macramed purple leather cording into the bracelet (see a tutorial here). Did I mention that this was my first time macrame-ing!? Yeah. I really enjoyed making these bracelets and I'm really proud of how they turned out. In fact, I enjoyed making them so much that you can expect to see a few more friendship bracelet posts in the near future. It was really nice e-meeting Miss Sassypants and I really hope Miss Sassypants enjoys her new purple friendship bracelets. And I can't wait to receive my new friendship bracelet's in the mail and show them off to my readers. That wrap bracelet is awesome. Nice job! That bracelet thats white on the right side of the top picture with the metal nuts looks just like some I saw at forever21.com the other day. I'm sure they aren't hard to make but i'm not a very good DIY-er lol.